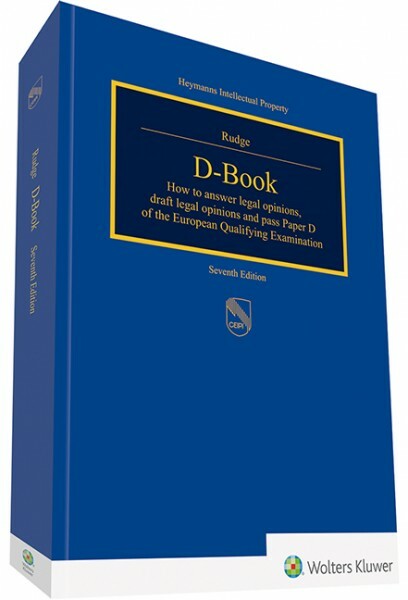 The D-Book has been prepared with the intention of offering advice and support for candidates preparing for and sitting the legal papers of the European Qualifying Examination (EQE) and Pre-examination. Part A offers general advice on how the legal papers should be approached and should be used in conjunction with attempts at past papers in order to develop strategy and tactics before sitting the exam itself. A certain number of key legal principles are explained in Part A, all the decisions of the Enlarged Board of Appeal are annotated with EPC1973/EPC2000 cross-referencing and techniques are demonstrated with past papers. Parts B and C set out the relevant law under the EPC and PCT, respectively that needs to be assimilated. Subject matter in these sections has been set out in a logical sequence that mirrors the stages of the patent examination and granting process an applicant encounters in real life. With all the relevant legal materials relevant to each topic brought together, and ordered systematically, it should be easier for even newcomers to patent law to locate important legal basis quickly. The chapters in parts B and C have been aligned to the maximum possible extent, allowing the reader to readily compare and contrast the counterpart stages of the EPC and PCT procedures. Andrew Rudge is British and lives in Kent, UK. He studied Natural Sciences at Cambridge University, UK, before completing a PhD in synthetic Organic Chemistry at the same institution. Having worked for several years as a medicinal chemist in industry, he trained to be a patent attorney, qualifying as a European Patent Attorney and Chartered Patent Attorney (UK) in 2004. He has tutored occasionally on the 2-year basic CEIPI course in London, and yearly on the CEIPI Paper D Seminar and CEIPI Pre-examination seminar in Strasbourg.